On our annual trip to Florida, a local man told my husband that we had to see Homosassa Springs Wildlife State Park in Homosassa, near central Florida's Gulf Coast. We're sure glad we took his advice — it's like no other state park we've ever visited. 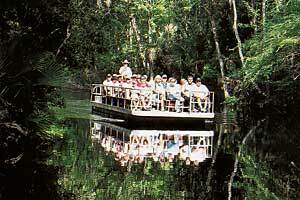 After a stop at the visitors center, which offers many fascinating exhibits, you ride either a shuttle bus or a pontoon boat to the park, built around a huge spring that's the headwater of the Homosassa River. The park is a rehabilitation center for injured or orphaned West Indian manatees; they stay here until they're ready to go back into the wild. There are only around 2,400 of these endangered animals worldwide, and this is one of the only places in the world where you can see them up close all year-round! At an educational program (offered daily at 11:30 a.m. and 1:30 and 3:30 p.m.), we learned all about these amazing animals. 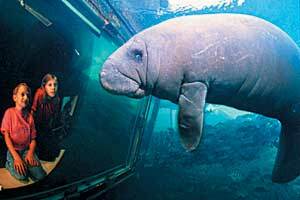 And we loved the floating observation platform, called the “Fish Bowl,” which gives you an underwater view of the endangered manatees, along with turtles and thousands of colorful fish that swim freely between here and the Gulf of Mexico. Not all of the 210-acre park's residents live underwater. From boardwalks and winding, unspoiled nature trails, we also saw black bears… bobcats… cougars… alligators… and eagles and other birds of prey. We can't wait for our next trip to Florida. If we find something even half as interesting as this state park, we'll let you know!